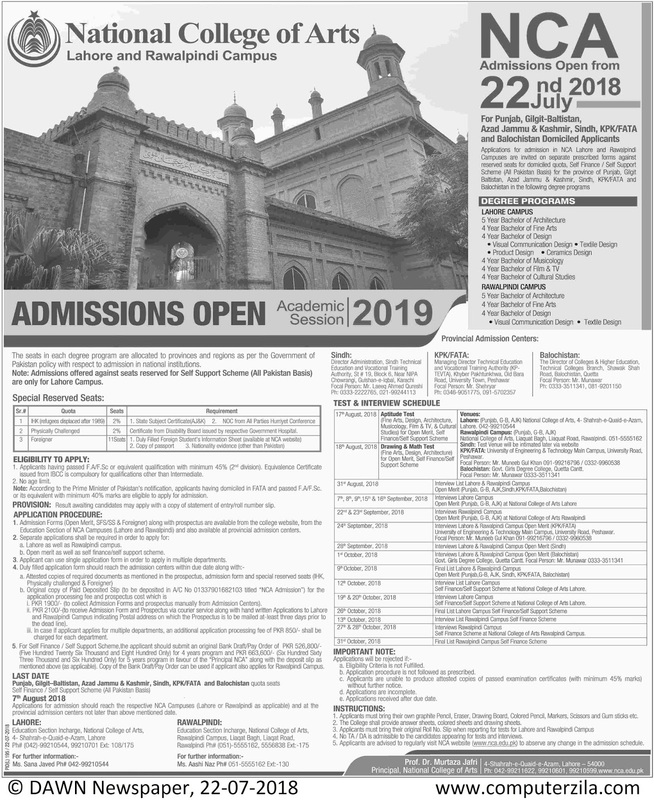 Admissions Open at National College of Arts's Main Campus, Lahore and Rawalpindi Campus for the batch Spring 2019. NCA offers admissions in different fields of study for Bachelor Programs. Admission Open in Academic Session 2019 at one of the most prestigious Arts institute in Pakistan. students from all over Pakistan can apply for this opportunity. seats are reserved for Self Support Scheme from all over Pakistan. Bachelors EligibilityApplicatns having passed F.A/F.Sc or equivalent qualification with minimum 45% 2nd division or equivalent, no age limit, students with FATA domicile can apply with minimum 40% marks in intermediate.